I know it’s not shocking, but it seems that the anti-gun proposals in California that needed to pass this week or else die found their way through the legislature and onto the governor’s desk. It seems the chance of California shooting down a gun control proposal are only slightly better than me dating Kate Beckinsale. And since I’m happily married to someone who isn’t Kate Beckinsale, that should clue you in on something. Now, four anti-gun bills are heading to the governor. Proposals to expand lifetime gun bans and make it harder to get a concealed carry permit are speeding to Gov. Jerry Brown. The measures — Assembly Bills 1927, 1968, 2103, and 3129— passed the state legislature with generally strong support from lawmakers this week and now head to the state’s Democratic governor for further consideration. AB 1927 would study crafting a law to allow individuals to voluntarily jettison their own gun rights. A similar law was enacted in Washington earlier this year, aimed at curbing suicides. 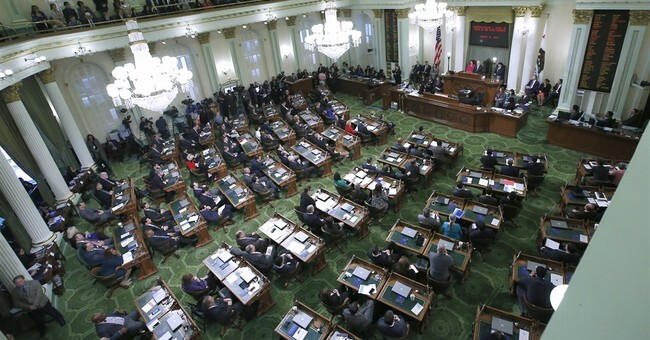 The measure was unanimously approved in both the state Senate and Assembly. Introduced by Assemblymember Rob Bonta, a San Francisco Democrat, with strong support from gun control groups, it was painted as a measure to protect people from themselves by scrapping their gun rights. The second bill, AB 1968, makes it a lifetime firearm prohibition for those who have been admitted to a mental health facility under certain conditions more than once during the same 12-month window. In short, it would trigger the removal of guns from someone placed on a 5150 hold in California twice in a one year period. Supported by the California State Sheriffs Association and gun control groups but opposed by gun rights organizations, the measure only picked up seven “no” votes during its legislative process. Of course, this also means people having a tough time may be far less likely to seek treatment out of fear of losing their ability to own firearms for the rest of their life. No one seems to give a damn about that, now do they? California gun control advocates are going to leave people wondering whether they should get the help they need for a short-term issue–an issue that doesn’t necessarily resolve itself overnight by may over time with work–or whether they want to hold onto their constitutional right to keep and bear arms. That’s a choice they shouldn’t have to make. If a condition is so severe that someone can never be trusted, there’s a process for dealing with that. You get them adjudicated by the courts and deal with it that way. This way, some more schmoe just trying to get well will forfeit his right to have a firearm at a later time, after he’s dealt with the problem, and this makes him feel like he’s wearing a scarlet letter for something in his past. Look, it’s one thing to create a bill that lets people jettison their own rights. I think it’s stupid and unneeded, but it’s not likely to hurt anyone except by their own choice. I oppose it because it’s unnecessary, but I’m not about to lose sleep over it. Yet AB 1968 is going to hurt people, good people. It needed to die, but now it’s going to become law and the morons who enacted it will never realize the lives they’ve cost doing it. Also passed were AB 2103 which adds a whole lot more hassle to getting a concealed carry permit–as if it’s not already hard enough in the state–and AB 3129 which changes the state’s 10-year ban on buying a gun for someone convicted of a serious misdemeanor domestic violence charge to a lifetime ban.